Center for Family Services wins PHFA Agency of the Year | Center for Family Services, Inc. Recently, Cen ter for Family Services Executive Director, Pam Leap Jarrell and Housing Counselor, Diann Bolharsky, made the drive to Harrisburg, PA to attend the Annual PHFA (Pennsylvania Housing and Finance Agency)Housing Counseling awards ceremony. What made the trip special was that CFS was presented with one of six Best Agency Awards in the state. “We are honored and so proud of Diann Bolharsky. 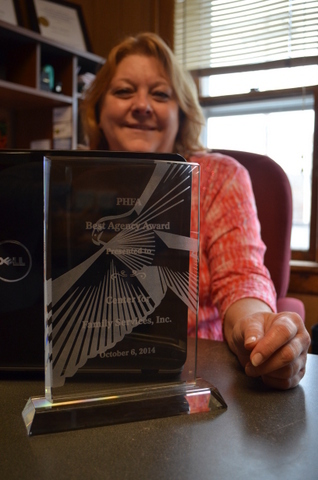 It is her dedication to her clients and attention to detail that helped us win the award.” Says Pam Leap Jarrell. The Center for Family Services is the only HUD approved Housing Counseling agency in Crawford and Venango counties and serves homeowners from as far away as Pittsburgh. CFS has been partnering with PHFA for many years. The agency’s Housing Counseling services focus on homeownership issues. Services offered include mortgage default (foreclosures), first time homebuyers education, predatory lending education, credit counseling and fair housing education. The successes don’t stop there. Last year, 72% of individuals receiving credit counseling improved their credit scores enough to qualify for home purchase mortgages and 54% of those same people were approved and bought homes here in Crawford County. Congratulations Diann! We think you are amazing. If you or anyone you know are struggling with housing issues or are ready to become a home owner, please contact us!